The American Academy of Pediatrics recommends that healthy infants be placed on their backs for sleep, as this is the safest position for an infant to sleep. Putting your baby to sleep on his back decreases his chance of sudden infant death syndrome (SIDS), which is responsible for more infant deaths in the United States than any other cause during the first year of life (beyond the newborn period). The exact reason for this finding is not certain, but it may be related to findings that suggest that an infant who sleeps on her stomach gets less oxygen or gets rid of carbon dioxide less because she is “rebreathing” the air from a small pocket of bedding pulled up around the nose. This recommendation of putting the baby down on her back applies to infants throughout the first year of life. However, it is particularly important during the first six months, when the incidence of SIDS is the highest. Even when you are sure your baby is lying on her back when going to sleep, it is also important to avoid placing her on soft, porous surfaces such as pillows, quilts, comforters, sheepskins, or bean bags—even soft materials used for stuffed toys—which may block her airway if she burrows her face in them. Also avoid having her sleep on waterbeds, sofas, or soft mattresses. A firm crib mattress covered by a sheet is the safest bedding. Keep all soft toys and stuffed animals out of your child’s crib throughout infancy. Keep the temperature in your baby’s room comfortable and do not place her near air-conditioning or heating vents, open windows, or other sources of drafts. Use sleep clothing (such as a one-piece sleeper) with no other covering, as an alternative to blankets. For an extra layer, a wearable blanket sleeper or sleepsack is a safe alternative. Pacifiers also may help reduce the risk of SIDS. However, if your baby doesn’t want the pacifier or if it falls out of her mouth, don’t force it. If you are breastfeeding, wait until breastfeeding is well established, usually around three or four weeks of age, before using a pacifier. While sleeping on the back is important, your baby also should spend some time on her stomach when she is awake and being observed. This will help to develop her shoulder muscles and her head control, and avoid the development of flat spots on the back of her head. As she gets older and her stomach grows, your baby will be able to go longer between feedings. In fact, you’ll be encouraged to know that more than 90 percent of babies sleep through the night (six to eight hours without waking) by three months. Most infants are able to last this long between feedings when they reach 12 or 13 pounds (5.44–5.89 kg), so if yours is a very large baby, she may begin sleeping through the night even earlier than three months. As encouraging as this sounds, don’t expect the sleep struggle to end all at once. Most children swing back and forth, sleeping beautifully for a few weeks, or even months, then returning abruptly to a late-night wake-up schedule. This may have to do with growth spurts increasing the need for food, or, later, it may be related to teething or developmental changes. 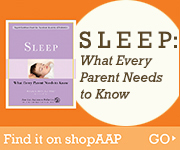 From time to time, you will need to help your baby fall asleep or go back to sleep. Especially as a newborn, she probably will doze off most easily if given gentle continuous stimulation. Some infants are helped by rocking, walking, patting on the back, or by a pacifier in the mouth. For others, music from a radio or a CD player can be very soothing if played at moderate volume. Certain stimulation, however, is irritating to any baby—for example, ringing telephones, barking dogs, and roaring vacuum cleaners. There is no reason to restrict your baby’s sleeping to her crib. If, for any reason, you want her closer to you while she sleeps, use her bassinet as a temporary crib and move it around the house with you. Based on an evaluation of current sudden infant death syndrome (SIDS) data, the American Academy of Pediatrics recommends that healthy infants, when being put down to sleep, be placed on their backs. Despite common beliefs, there is no evidence that choking is more frequent among infants lying on their backs (the supine position) when compared to other positions, nor is there evidence that sleeping on the back is harmful to healthy babies. In some circumstances, there are still good reasons for placing certain infants on their stomachs for sleep. Discuss your individual circumstances with your pediatrician. Since 1992, when the American Academy of Pediatrics began recommending this sleep position the annual SIDS rate has declined more than 50 percent.